Moisturizes & revitalizes. Free of: sulfates, parabens, phthalates, gluten, drying alcohol and artificial colors. 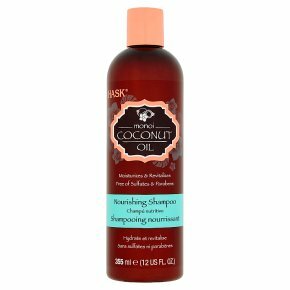 Not tested on animals.Hit the snooze button and give your hair a tropical vacation with Hask Monoi Coconut Oil Nourishing Shampoo. Infused with softening monoi oil, a blend of Tahitian gardenias and coconut oil, to hydrate and strengthen, this shampoo gently cleanses leaving even the most lifeless locks refreshed and revived. Ideal for all hair types. Directions: Apply to wet hair. Massage into a lather, rinse thoroughly and repeat if desired. Ideal for daily use. For best results, use the Hask Monoi Coconut Oil collection.